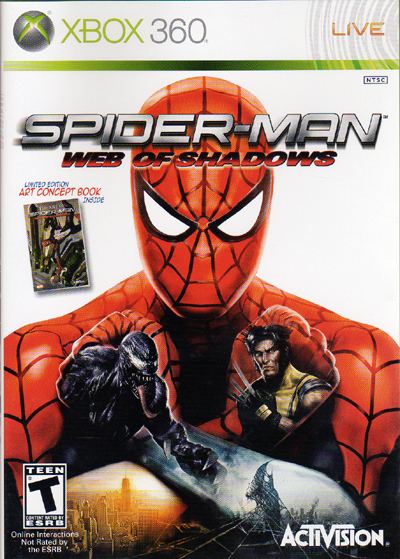 In usual Activision fashion, each franchise must have a new game once the holiday season rolls around, and this years Spider-Man, subtitled "Web of Shadows" is the lastest. As with previous games in the series, if there isn't a movie name tied to it, the story doesn't connect to anything. This year, Venom is back and his symbiotes have taken over the city. It's up to Spider-Man to stop it, but does he do it as Red Suit, or with the Symbiote Suit? These are the kind of hard hitting questions that Web of Shadows looks to answer. And I guess it does. You can play with either suit at any time, by merely clicking in the left stick. There isn't much difference between them though. The symbiote has more hardhitting attacks and less combos, while the red suit is the opposite. I gravitated towards the Red suit just because the combos could go on pretty long and jumping around in the air is always cool. There are also story choices that you make throughout the game, but really that just changes which secondary characters comes to your aid when you need it. Really all it does is show you one cinematic over another. As you progress through the story, you'll meet both good and bad guys, and depending on your good/bad meter, certain ones will help you out. The usefullness of having anyone come to help is pretty minimal. I tried it a few times myself, only to lose track of the person and then have the disappear. Didn't seem to do much. The fun really comes from the new combat system that Spider-Man has though. With air, ground, and wall attacks, it really is fun to go into a battle and jump all around the different surfaces and continue to fight. The only problem I hit was the wall combat sometimes threw the camera for a loop. You can upgrade all of the different attacks, which will break out new combos to use, though the standard X,X,X combo never went out of style. Instead of healing pickups, your healthbar now automatically regenerates as time goes on. So what it boils down to is, fight dudes, health drops, run away for 30 seconds, get health back, jump back into battle. I'm not sure I ever actually died. I failed some missions because of time or civilian problems, but I don't think I died because of no health. So yeah, the game is kind of easy. The mission structure is your standard, see icon on radar, go to that, get mission, repeat. For the most part, the missions are varied, but as the game goes on, the missions become more and more repetitive. It feels like half way through, they just ran out of ideas. It all becomes very exhausting. Though the light at the end of the tunnel is the last handful of missions which are very fun and interesting to do. There is some story in between the missions, but very rarely does the mission fit in directly. Usually it's "Go kill 30 symbiotes and come back" and then Black Widow explains what's happening. There's a host of extra characters that show up, such as Moon Knight. They either serve to give you more missions, or sort of help like I mentioned above. Mary Jane is there too, but she might as well have been left out completely. I mean, even for a comic book game, the story was kind of weak. Spider-Man games are one of those things that I buy every year almost without hesitation. I'm just a comic book nerd and that's how I roll. As Shaba Games first stab at the franchise, it turned our really well on the gameplay side, even though the story that surrounded it wasn't anything to write home about. I look forward to seeing what next year has in store, and hopefully they can create a better game to put the action inside.